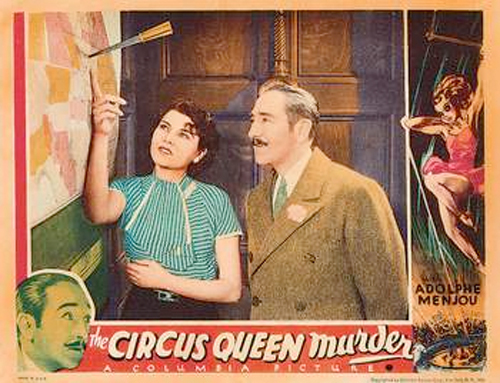 The TCM blogger moirafinnie decided to highlight a different forgotten star from the film, Dwight Frye (the Circus Queen's husband, and fellow trapeze artist extraordinaire) They only give a small, passing mention to Ruthlema (and a backhanded compliment, "a character played with some considerable warmth by forgotten starlet Ruthlema Stevens") but the main reason I was so excited to find this post is the lobby card they have pictured to accompany it. It has a picture of Ruthelma on it! I was shocked to find this, especially because it seems like this poster, just like the other one I featured, doesn't have her name on it, despite the fact that she is the female lead! Also, as I mentioned in my first post about Ruthelma, I couldn't find one single picture of her on the internet when I was researching my post. I was just so giddy to find this that I had to share it with you! What a cool lobby card. Adolphe Menjou looks so young. It seemed he was the distinguished older gentleman throughout his long career. If you've never drawn him I think you should consider it. I know what you mean about googling terms to see where your blog comes up! Except I've never actually specifically looked for me, but I find myself in the search results all the time. Apparantly I'm the only one with 1920s knitting patterns, Minta Durfee (my Flickr), and Al Bowlly. Elizabeth- you temporarily have the market cornered on Al Bowlly-- at the end of my summer song of the week series (where I'm only doing singing movie stars) I'm going to do an Al Bowlly post :) I have to go check out Minta Durfee though!